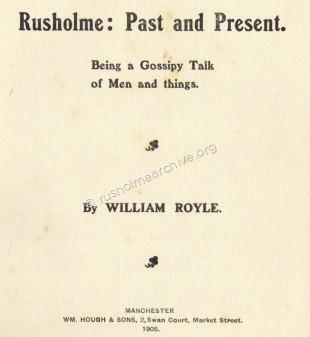 In March 1905 William Royle published his 'History of Rusholme' with the intriguing sub-title of 'Being a Gossipy Talk of Men & things'. 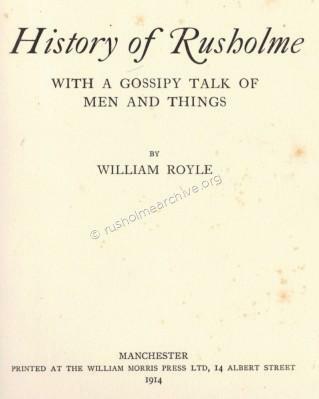 The content of the book was based on a lecture given by William Royle in the Rusholme Public Hall. An advertisement in the Manchester Guardian referred to the lecture as being given on March 9th at 7.30pm. 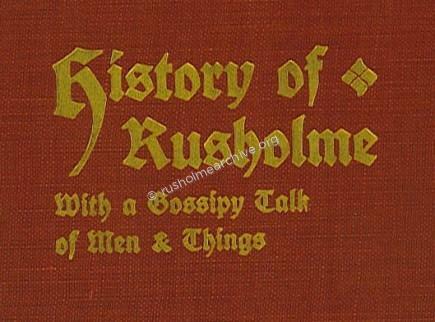 The headline in the advertisement read, 'Platt Fields & Old Rusholme, A Gossipy talk of Men & Things' with 150 photographs of Old Rusholme and Rusholmites. Admission Free. This first edition totalled 58 pages of which the last 10 pages are an appendix. 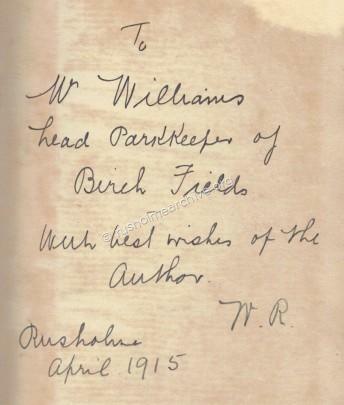 I presume that the book, printed by William Hough in Manchester was perhaps for for private circulation, I have yet to come across a copy that is priced, but most that I have seen usually have an inscription by William Royle as being a gift to a particular friend. In 1914 William Royle published a revised and rather more comprehensive version printed by William Morris in Manchester and containing a total of 86 pages, this includes a similar appendix but this edition also has an index. What is particularly interesting about this extended version is that William Royle covers the period of 1906 with his account of the public agitation for the Manchester City Council to acquire Platt Fields as a public park. This copy certainly was on sale to the general public, the price at five shillings, (25p), may well have put it beyond the reach of many of the poor of Rusholme that William Royle frequently refers to. I have now scanned the 1905 version to a PDF file so that you can read a copy at your leisure. You will need the Adobe software to read the file but just click below and save the file to your computer. The 1914 edition has now been scanned in one complete volume. COPYRIGHT. I am confident that these two books can now be put into the public domain without infringing any copyright as the author died in 1923. If there is any person who feels that I am mistaken about the copyright of the books perhaps they will contact me. 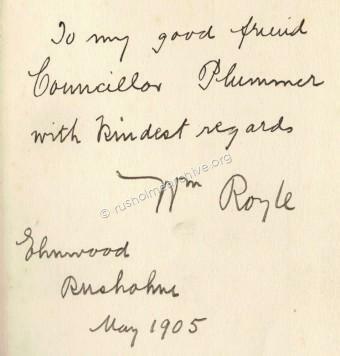 My final thought on this issue is that I am sure William Royle would be very pleased that his 'History of Rusholme' was freely available to be read by all. 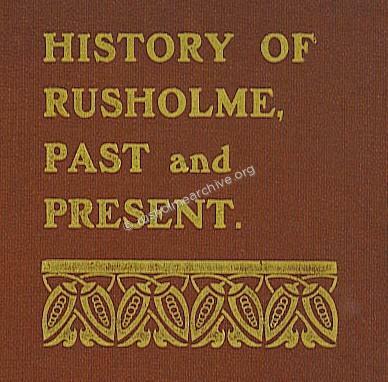 History of Rusholme 1914 ed.